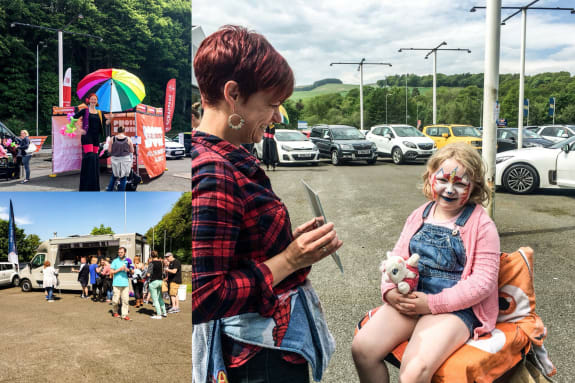 On Saturday 26th May Leven Suzuki/Kia Selkirk held a family fun day to launch The Leven Car Company in the Scottish Borders, which an astonishing 150+ people attended. It was a great success, with the sun shining down on the event throughout the day. As it was an event based around a 'fun family day' there was a lot to see and partake in upon arrival such as face-painting by Snazzy Smiles (who were amazing), entertainment by balloon modellers and even stilt walkers... It's fair to say that the children were kept very busy! We partnered up with Mackays of Eyemouth for the event, who served delicious hot fish & chips and ice cream - perfect for the sunny summers day that it was. People received complimentary vouchers to spend at this Mackays van from the team at Leven Selkirk, as a token of our gratitude for attending such an important day to us. Games of Hide and Seek with the children were also in full swing... and with the prizes being Kia footballs, Kia Torches, Suzuki T-Shirts, hats etc - it proved to be a popular one! Three 'star cars' were on display outside our dealership. An Aston Martin Rapide S visited from our sister branch, Aston Martin Edinburgh and people really went crazy for this car, and we can definitely understand why. On top of this, we displayed the all-new Swift Sport and Kia Stinger, which also got a lot of attention. We appreciate all of the nice comments about the event coming in and we hope to do more like this in the near future! Jim (Dealer Principal), Caroline (Sales Manager) and the team would like to thank everyone for their attendance. Having won various awards for customer service for our Aston Martin and Rolls-Royce dealerships in Edinburgh, we know exactly what it takes to provide a world-class service and we cannot wait to become the number one place in The Borders for KIA, Suzuki and pre-owned cars.